• Botanical Name: Areca catechu. • Synonyms: Areca nut, pinang, siri, supari (Hindu), and ping lang (Chinese). • Geographical Location: India, Malaysia, Polynesia, and the South Pacific Islands. • Habitat: Light soil with heavy rain. • Botanical Description: A slender climbing tree that grows up to 75 feet high, with a ringed trunk that is usually trained on poles or trellises in a hot, but shady environment. The leaf blades grow to be as wide as 3 feet across with many pinnae and many veins. In 1930 it was estimated that there were at least 20 million betel chewers in India. 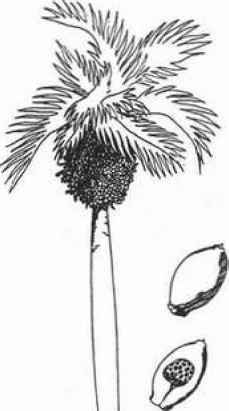 One betel palm produces about 250 seeds or nuts per year and millions of these trees are under cultivation. It is one of the world's most popular plants, yet few Western people have ever heard of it. The leaf is converted into paper for rolling tobaccos and herbs. Regular use of betel nut, in time, stains the mouth, gums, and teeth a deep red. Asain betel chewers, however, are quite proud of these stains. Arecoline, a volatile oil, is released from the nut by saliva and lime (calcium oxide). Betel leaf contains chavicol, allylpyrocathechol, chavibetol, and cadinene. Mix 1/2 gram of burnt lime (hydrated calcium oxide) with one betel nut, preferably in a semi-powdered form. Place in the side of the mouth like a plug of tobacco for two hours, spitting the saliva occasionally. Because of the primary effects of arecoline, betel nut is well suited for manual labor. This central nervous system (CNS) stimulant also makes a journey more vivid because it affects one's perception of time. The herb is perfect for weekend journeys to friends in the country, or for ceremonial work on your land. The Malayan technique for using betel nut is to mix a mashed or powdered betel nut, some catechu gum from the Malayan acacia tree (Acacia catechu), a pinch of burnt lime, and a dash of nutmeg, cardamom, or turmeric for flavor. This mash is then rolled up in a leaf from the betel vine (Piper chavica betel). These betel morsels are sold on the streets in markets as candy (with no current government control). Note ofCaution: Excessive arecoline from either overuse or chewing unripe areca nuts, which contain larger quantities of the oil, can cause inebriation, dizziness, and diarrhea. Also, prolonged use causes damage to the teeth and soft tissues of the mouth. Betel nut is considered an aphrodisiac because it stimulates available energy and elevates moods. It is currently used like coffee or cigarettes in this country. • Botanical Name: Ephedra nevadensis. • Synonyms: Stick tea, desert tea, squaw tea, brigham weed, teamsters tea, and popotillo. • Geographical Location: Native to the southwestern United States and Mexico. The variety of ephedra presently used in most commercial preparations is Ephedra gerardiana (Wall.) Satpf., commonly known as ma Huang. It is imported directly from China. 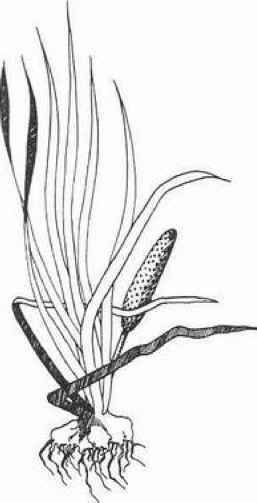 Two similar plants, E. sinica and E. equisentina, are found in northern China from Sinkian to Hopen Province and north to outer Mongolia.